a man with a backpack behind his back sits on the edge of the mountain and opens a laptop. Shot from the side. 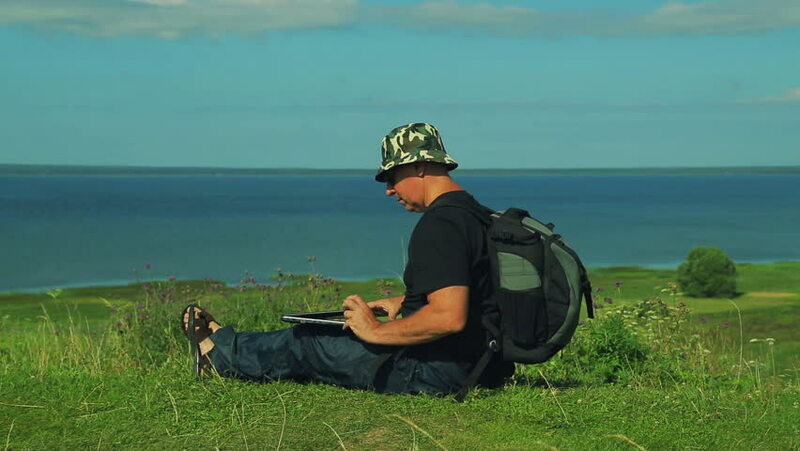 hd00:05a man with a backpack behind his back sits on the edge of the mountain and prints on a laptop. Shot from the side. hd00:05a man with a backpack behind his back sits on the edge of the mountain and admires the view of the lake. Shot from the side. hd00:19A child with a backpack enjoying the scenery. A little girl in a helmet sits on the river bank. hd00:05A tourist with a backpack behind him runs through the forest. Shooting from the back. hd00:05time laps. hands of the woman of the cosmetician remove from the person of the man a mask from the banana. hd00:05the man near the tent turns over the grill with the fish and stirs the coals in the grill. hd00:05A woman near the tent in the nature fries a shish kebab and drinks tea. The man sits down next to the laptop. hd00:08The illuminator man closes the diaphragm of the profile spotlight and induces light. hd00:09A man in glasses at the edge of the forest draws diagrams in a pencil with a pencil. hd00:06A man and a woman near the tent grill meat on the grill, drink tea and work on a laptop.